If you happened to log on to Google on Sunday, you saw the page’s doodle was devoted to Maria Félix in honor of what would have been her 104-birthday. This type of exposure on the most viewed page of the internet naturally inspires lots of stories about the subject. I dove into several. Each time, I was expecting to find out more about the Mexican movie star’s incredible Cartier jewels. Not one of the pieces covering her life mentioned the jewelry at all. To me this would be like writing about Elizabeth Taylor and leaving the jewelry off. Well, maybe that’s an overstatement, but Félix’s Cartier jewelry was epic. It’s has appeared in countless exhibits and certainly had meaning for star. What exactly the meaning was remains shrouded in a bit of mystery and myth. It seems clear that Maria Félix identified with snakes for all the symbolism of creativity, wisdom and strength the creatures represent. She wore snake jewelry throughout her adult life. Note the bracelets on the star in the photo above taken in 1959. 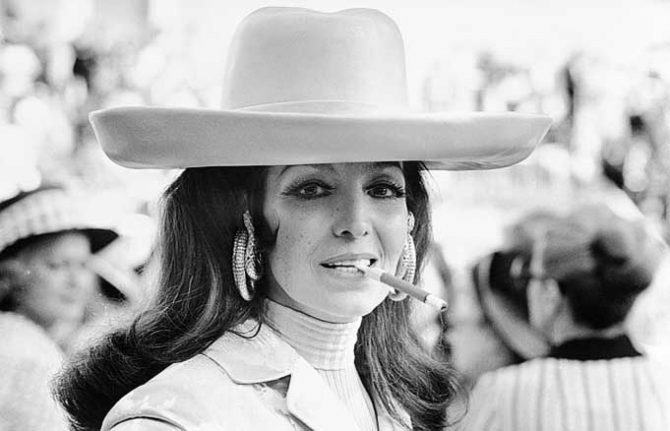 Her style became much bolder in the mid-1960s, a period when her main residence was in Paris with her third husband, a Swiss businessman named Alexander Berger. Around 1966 she visited the Cartier flagship on the rue de la Paix and commissioned a snake necklace she wanted to be the size of, well, a large snake. Cartier took two years to make the 22-inch long serpent. A good portion of the time was most likely spent figuring out the platinum and gold armature on the interior of the design that made it fully—and I mean fully—flexible. Then the master craftsmen had to figure out how to cover the body in diamonds. There are 2,473 brilliant and baguette-cut diamonds weighing a total of 178.21-carats on the design. Similar to the way traditional Indian jewels featured enamel on the reverse, the scales on the bottom of the snake are decorated with green, black and red enamel. When the piece was finished, apparently Félix was out of town. She was so thrilled to hear her jewel was finally complete, she chartered a plane back to Paris to get it. While the design is extraordinary, it doesn’t look like anything else Cartier has ever created. It’s savage in a way that’s more of novelty than the refined jeweler executes in its rendition of barbaric. According to Hans Nadelhoffer, Cartier’s first biographer, the piece was based on a design by Gabriel Raton. The jewelry expert who died in 1988 did not expand on who Raton was and to my knowledge his name has never been mentioned in a Cartier book again. Other layers of mystery surrounding the jewel include the question of what was the occasion for the commission? Usually an order like that is done for a reason, a celebration, something. It’s possible the snake was just ordered on a whim. 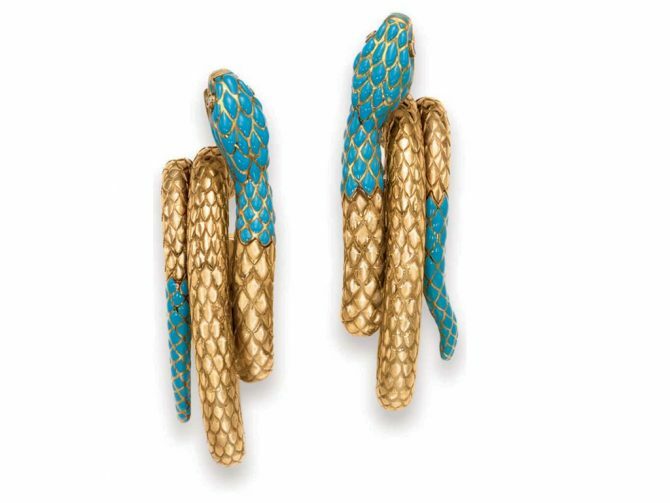 A few years after she acquired the necklace, Félix special ordered a bold pair of gold snake hoops with turquoise covering the scales on the head and the tip of the tail. Little rubies form the eyes. While the earrings are far from the look of a Cartier stock item, they do feel more like the French jeweler’s menagerie of animals made over the years. They are Parisian savage which is to say elegant. 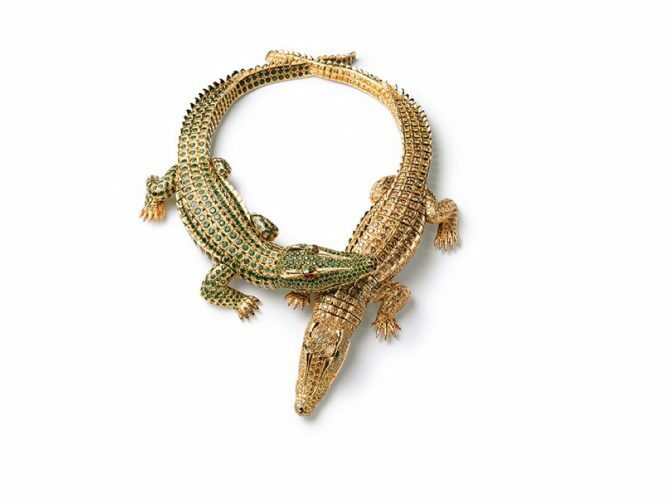 In 1975 Félix commissioned her most exceptional reptile jewel, a double alligator necklace. 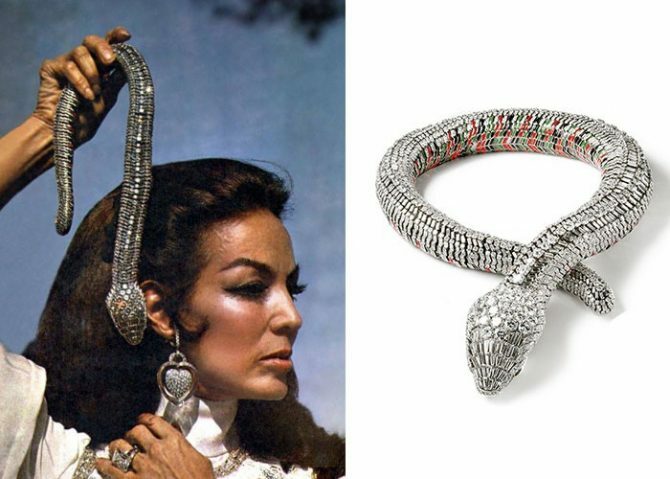 The legendary story behind the design is that La Doña waltzed in Cartier with a live little baby alligator as a source of inspiration. It certainly could be a true story, but I sense the tale has been told because of the star’s bold personality and the remarkable realism to the alligator’s skin, called scutes, in the jewel. Beyond the scutes, Cartier took creative license lighting up the yellow gold gators with gems. One alligator is covered in 1,023 brilliant-cut fancy intense yellow diamonds weighing 60.02 carats. Navette-shaped emerald cabochons form the eyes. The other is covered in 1,060 emeralds weighing 66.86-carats. It has ruby cabochon eyes. Like the snake, the crocodiles are entirely articulated with interior armatures. The design is also credited, with no additional detail, to Gabriel Raton by the author Hans Nadelhoffer. Unlike the snake, the double alligator feels very much like a work from Cartier. It is bold yet refined. No occasion for the commission has, to my knowledge, ever been revealed beyond Félix’s passion for reptiles. When the jewel was complete Félix was so delighted with the results she offered a champagne toast to all the craftsmen at Cartier who worked on the jewel. Mysteriously before she died in 2002, Félix sold the alligator and snake necklaces. The earrings remained in her collection. Why she deaccessioned the necklaces isn’t clear. She didn’t seem to need the money. 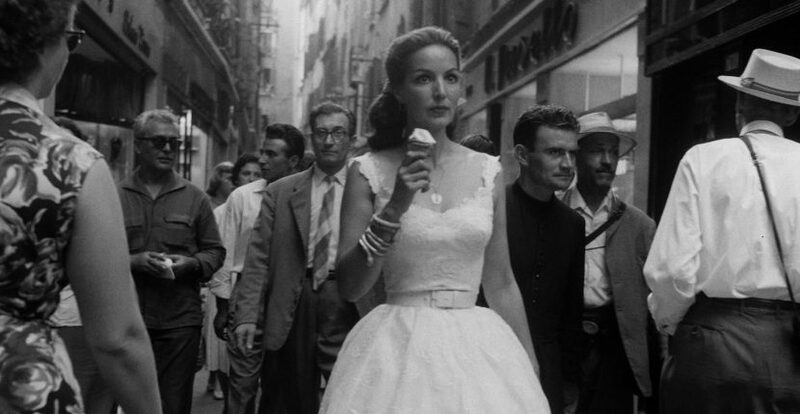 She had homes in Paris and the Polanco quarter of Mexico City. Her husband even left her with thoroughbred racehorses that were kept at a stable in Chantilly. It has been said she got rid of the jewels because “she wanted to make a change in her life.” To me that doesn’t make sense. It feels like there has to be more to the story. Whatever the case may be, The Cartier Collection eventually acquired both jewels and the firm has continuously viewed the star as one of its most important clients. The year before she died, the first director of the Cartier Collection, Eric Nussbaum, couriered the necklaces to Mexico for her to wear in a documentary about her life.